37 years old male got knee injury in army. Loose cartilage fragment was removed, cartilage lesion in sulcus was debrided and microfractured in arthroscopic procedure. 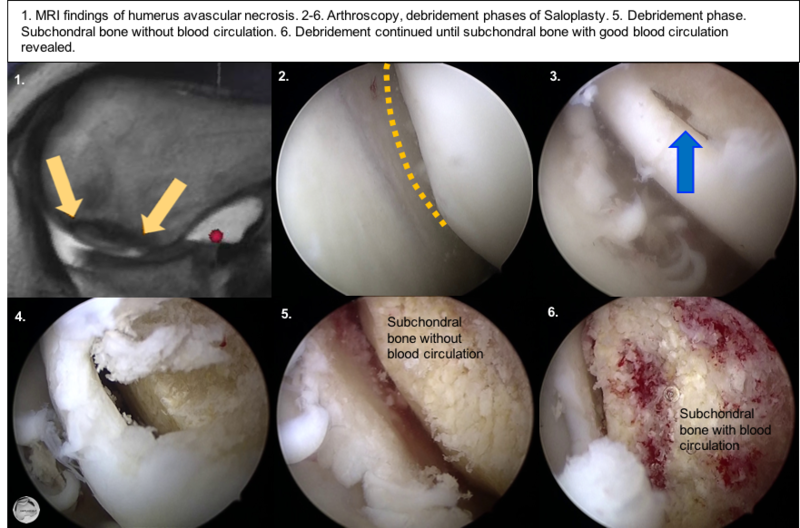 After the second knee injury cartilage flaps in sulcus were debrided again in the second arthroscopy. In 2010-2012 patient was not able to do sports anymore, knee joint was swelling after physical activity and joint locking was present in daily activities. Locking in patellofemoral joint was also present in clinical tests. CBCT revealed bone hypertrophy in sulcus and a new cartilage lesion. Below are presented CBCT images and arthroscopy findings. Hypertrophied bone was shaped to its original concave shape and cartilage lesion was treated with demineralised bone matrix. Patient is active in sports and doing well. Avascular necrosis in bone can cause bone collapse under cartilage. Cartilage layer retain it's integrity, but it is not any more connected to subchondral bone in these cases. Pain comes from the bone side, and drillings are suggested to stimulate blood circulation in bone. If cartilage reconstruction is planned, then it has to cover renewal of the whole osteochondral defect. Below is an example showing retrograde large abrasion and filling with demineralised bone matrix. OCD or osteochondral dissecans can also be treated arthroscopically with this kind of technique. 27 years old male climber had OCD as a result of ankle torsion injury in summer 2015. In January 2016 OCD was revealed with CBCT imaging and Saloplasty was made. Patient used crutches for 6 weeks post-operation with touch down weight bearing allowed, non weight bearing joint mobilization. Training was started next day after operation. Patient has returned to his normal physical activities and sports.